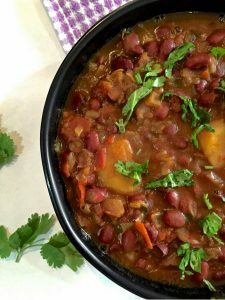 Flavourful, nutritious Rajma masala curry of pre-soaked, well cooked red kidney beans in a thick onion gravy, spices & turmeric. Best with hot Rice or with flatbread. Wash the raw Rajma beans, soak in about 4 cups of water. The water should be at least twice the height of the rajma in the vessel in which soaked. Leave the rajma to soak overnight or for 10-12 hours. After the period of soaking is over, drain the water completely and discard the water. Rinse the beans thoroughly with fresh water. Though Rajma is nutritious, the raw rajma beans contain a toxic element which is removed by soaking, rinsing and cooking in high temperature for adequate time as detailed in the instructions below. Remember that cooking times can vary depending on the variety and quality of the beans, so give yourself plenty of time to prepare the curry. 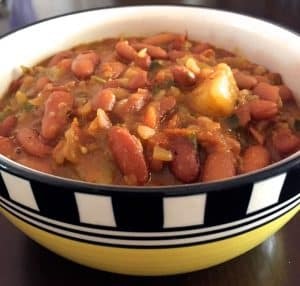 Once the cooker has cooled enough for the lid to be opened, check if the rajma has been cooked soft - press one between your fingers (cool the bean first!) and see if it gets mashed. If not soft and mashable, keep again in the cooker (add upto one cup of water only if all the water has been absorbed) and pressure cook again for 4 whistles on high flame. 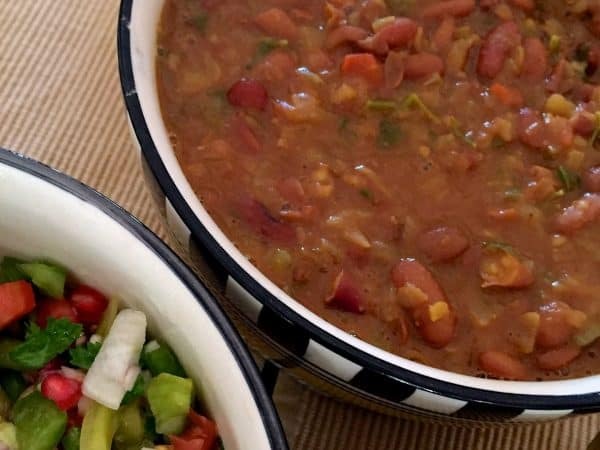 Usually if the rajma has been soaked overnight, it should get cooked the first time around. Drain the cooked rajma and this time retain the water in which it is cooked. Slice the chillies, mince the garlic and ginger. If preferred, use ginger and garlic pastes instead. The minced garlic and ginger add pleasing texture to the food. Mince the onion, dice the tomato into small even sized pieces (about 1 cm cubes) so that they cook fast and uniformly. Peel the potato and cube it so you get pieces of about an inch in length. You don't want small pieces of potato in the rajma, large chunks are better. Place the potato cubes in a bowl of water till ready to use. Wash and mince the fresh coriander leaves. I usually leave them in a small bowl of water so they remain fresh till I need them, and then I drain and mince the leaves just before using. Half this quantity is to be added to the masala, and the rest for garnish. Add minced onions, stir well and sauté till the onions are fried, 1 -2 minutes on low flame, stirring frequently so the onion does not catch at the bottom of the pan. Ensure the onions don't brown. Add ginger and then garlic (paste or minced). Stir each well, sauté for about 5 seconds each, on low flame. Again ensure the garlic does not begin to brown. Keeping the stove flame on low, add the tomato slices. Stir well. Drain and add the potato slices, stir well. Always stir so that the onions and garlic are lifted away from the bottom of the pan as they can easily catch and char. Again stir the entire masala well and sauté for 2 minutes on low flame. Add about half the minced coriander leaves and reserve the rest for garnish. Stir! Add the tomato puree, and stir. Add the drained cooked rajma, stir briskly, (I stir till my arm aches!) turning the rajma and its masala several times, scraping the bottom of the pan so that masala does not stick. Stir for at least 5 minutes. Transfer the contents of the pan to the pressure cooker. 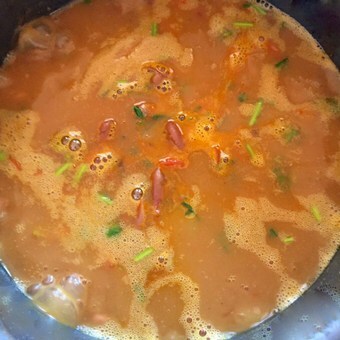 Add back the water in which the rajma was cooked. You need sufficient water to just cover the rajma masala. Add more or less water depending on this. If you need to add fresh water as all the cooking water has been absorbed, ideally add warm water. Stir once. Add salt to taste. (remember you have added a little salt while cooking the rajma, so a taste check would be helpful here). Close the cooker, and cook on high for 2-3 whistles. 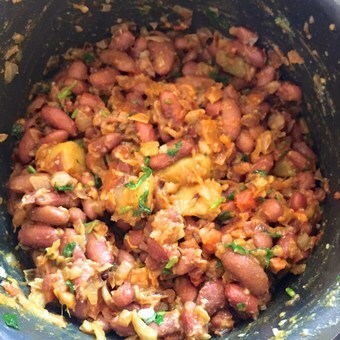 To serve: Transfer the rajma masala to a serving dish, garnish generously with minced coriander leaves. I keep lemon wedges available for those who want to squeeze some lemon juice on the rajma. Send a picture of the rajma please! Looks delicious and nicely explained post. Almost the final word in comfort food around our household for 3 generations now& makes for perfect weekend meals!